While pet battling can be a good time, sometimes it's a lot of fun to think how our favorite companions might fare in a different kind of fight. The ring is ready for another Pet Battle Royale! Here, we present different battle pets and then you, the WarcraftPets community, vote to determine the winner. Much of the story of Legion talks about togetherness and defeating a common foe. However, through the fjords of Stormheim a very different tale is told. The Worgen and the Undead, Genn Graymane and Sylvanas Windrunner, are locked in a conflict that began long ago. Each side is trying to find redemption in their partnership with the Val'kyr, but it remains to be seen just who the victor will be. So let's figure out who might win the pet battle. 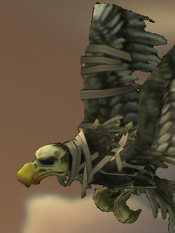 So, WarcraftPets, who should win? 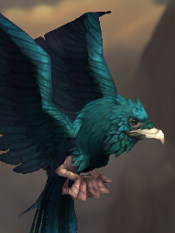 Both the Raven and Blighthawk are fairly prized as battlers. The Raven has even had a spot in our Pet of the Month feature before. Both have seen a fair amount of action in both PVP and PVE, which is no surprise since they both have decent utility and killer DPS. No, the issue here likely amounts to your garden variety faction war. Are you behind the Lich Queen as she seeks the power of the Val'kyr, or do you support Genn Greymane's blind struggle for vengeance? Voting ends September 19thth, so don't delay in helping decide which pet takes all!